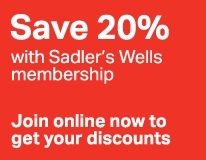 The Sadler’s Sampled festival debuted last summer, and was inspired by a weekend programme of the same name that has been an annual fixture at Sadler’s Wells since 2007. A unique event, the weekend programme has presented a diverse assortment of dance styles, from hip hop to flamenco, along with free talks, events and activities throughout the building. That original weekend now forms the finale of the Sadler’s Sampled festival, offering the same showcase of genres from around the world, with its new name: Playlist. This year, the bill features Jasmin Vardimon Company who will perform an extract from their repertoire entitled Tomorrow, Argentinean tango from German & Gisela who are world champions and stars to Tango Fire and m¡longa, the National Youth Dance Company performing their latest work choreographed by Akram Khan, acclaimed contemporary dancer Daniel Proietto dancing Sinnerman a work by Alan Lucien Øyen, Birmingham Royal Ballet with a pas de deux from Don Quixote, and ZooNation Dance Company who will perform an extract from their new work. See examples of work by companies involved in Playlist in our YouTube playlist below.